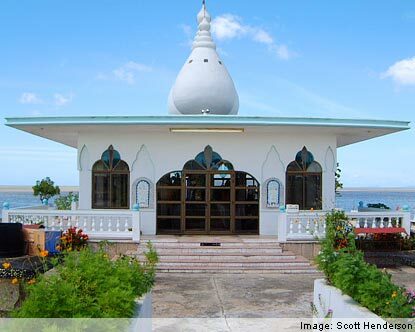 In Trinidad, Hindus traditionally practice worship at the temples in their community however, there is a specific temple that stands out, the “Temple in the Sea” in Waterloo. The history of the temple dates back to 1947, when a man by the name of Siewdass Sadhu constructed a mandir on private property which became the main temple of the Waterloo area as the community regularly used it as a place of worship. It was on the land of sugar estate owners Tate and Lyle. Five years later in 1952, Tate and Lyle demanded that Siewdass Sadhu destroy the mandir because it was trespassing on their property. Siewdass refused and as a result was fined 100 pounds or $500 TT which was a considerably large sum of money since labourers in this time made only $20 TT a month , and was also given two weeks in jail during which time the mandir was destroyed via bulldozer. 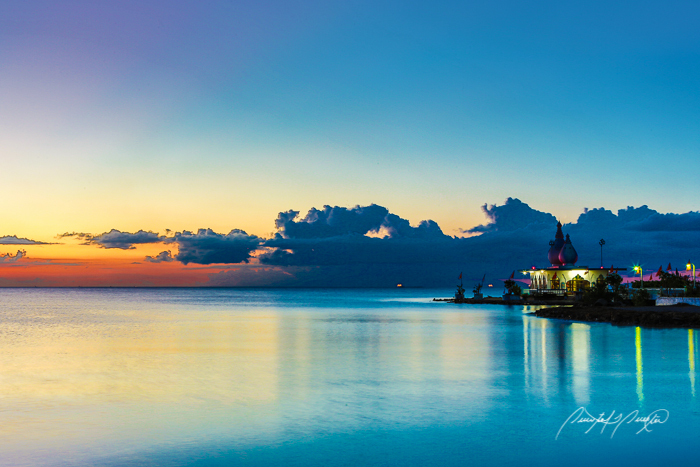 Sadhu swore to rebuild his temple on “No man’s land” and began what would be a seventeen year project to create the Temple in the Sea. The Hanuman Temple was a project started by Sri Ganapati Sachidananda Swami ji whose(2) “mission whereby he would spread the eternal message of Sanantan Dharma to the world; instructions given to him by his mother, Shree Jayalakshmi Mata”. He established a temple in Princess Town and later helped to establish the Datta Yoga Centre. The 1st stage of the Hanuman temple can be attributed to the small Ashram that now sits opposite the temple. (3) “ In the year 2000, Swami ji make a sankalpah( decision) to construct the finely crafted South Indian style temple and murti on the temple grounds. The initial choice of the murti was Lord Venkateswara. This was altered however to the choice of constructing a murti of Lord Hanuman instead.” The reason that Hanuman was instead chosen over Lord Venkateswara was the history that was brought by our ancestors as indentured labourers. They brought with them the story of the Holy Ramayana and to this very day that story plays an intricate role in identifying with the Hindu community in Trinidad and Tobago. The original height of the hanuman murti was catered to be 60ft to coincide with Swami ji’s sixtieth birthday but that plan was changed and height was agreed to be 85ft. Swami ji had 20 skilled artisans and one main sculptor come from India to work on this project which would be closely monitored by him and work under his guidance. The construction officially began in 2001 and the awareness of the project was made to the Hindu community by pundit at religious functions and Ramayana which in turn allowed the public to play their part in terms of financial aid. The construction of both the murti and the temple was finished on the 30th of June 2003. (4) “A mere 21 days later, the sugar cane industry was closed by the then government. Our ancestors were brought from India many years before for the specific task of working on the sugar cane plantations. 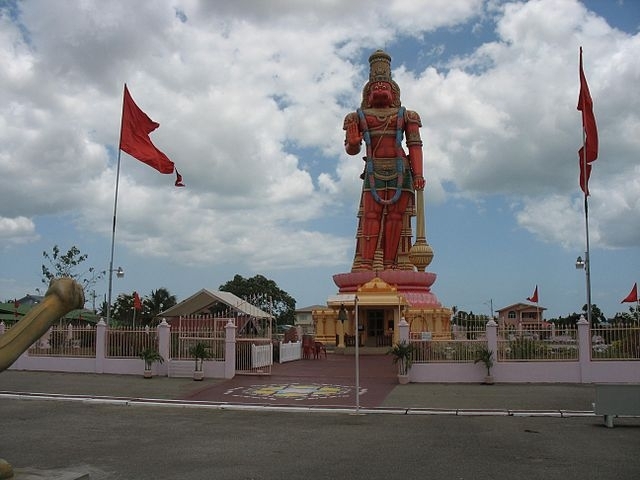 Over the years, passing from generation to generation, these sugar cane fields became a dear and important to our culture; it became part of our identity.” The presence of this Lord Hanuman murti, one that would be an everlasting milestone in the progress of Hindus in Trinidad.It restores some sense of pride and retains identity of the Hindu, as it is not only a representation of an on-going devotion but more so a representation of something that was equally as significant as these sugar fields were to our ancestors, our Ramayana. In the words of the swamiji, “in years to come, this place be 50% visitors and 50% devotees and all types of visitors will come.” Hanuman murtis are being constructed at other Swamiji ashrams all over the world and it seems that our very own murtis become the catalyst for this endeavour. 1 -Bhagwat Aneela. National Council of Indian Culture Annual Commemorative Magazine 24th Edition, Divali Nagar 2010, Tirtha, Global Hindu Pilgrimage Sites. Pg 22.